Dr. Peng's office has the latest dental technology and expertise to meet all of your dental needs. Our practice focuses on ADVANCED IMPLANT DENTISTRY, cutting-edge LASER DENTISTRY, and PERSONALIZED COSMETIC work. Our skilled team, led by Dr. Peng will ensure your dental health is well cared for. Our goal is to provide a better dental experience through personal care, higher quality products, and superior technology. Dr. Peng provides cosmetic dentistry that helps patient to have a more natural appearing smile. New techniques and materials allow Dr. Peng to preserve more of the natural tooth structure and better match the color of a patient’s natural teeth, and perform most of the procedures in-office without referring to specialists. The result is greater patient convenience, shorter recovery times, and a more natural looking smile. During the cosmetic consultation process, we will take a picture of your current smile and, using the services of Virtual Smiles®, we will show you what your new smile will look like. Virtual Smiles® creates professional digital simulations that to show a realistic representation of how a cosmetic procedure is likely to turn out. It is comforting to know what the end result will look like while going through the consultation and planning process. Teeth Whitening: The most common cosmetic treatment, teeth whitening, is used to improve the overall appearance of teeth that are stained because of inadequate brushing and flossing practices, nicotine use, medical treatments or illness, or from consuming certain foods and beverages. Dr. Peng offers in-office, laser whitening as well as take-home whitening trays. Let us show you how beautiful your smile could look and don’t forget to ask about our lifetime whitening club. Composite Bonding: This technique uses a composite (tooth-colored) material to give a natural appearance to fillings and repairs. Teeth with decay, cracks or chips can be transformed simply by applying the composite material to the tooth, sculpting it to match the surrounding natural tooth structure, and then hardening the finished shape. Inlays, Onlays and Veneers: Inlays, onlays and veneers are laminates used to cover discolored teeth and to repair larger gaps, cracks and chips. Using composite material or porcelain, these are created at a lab and then bonded in place by Dr. Peng. Dental Implants: Implants replace a lost or extracted tooth by placing a titanium tooth root in conjunction with a natural looking crown. The benefit to our patients is reduced bone loss, the retention of function, and a more natural full cheek profile. Dr. Peng’s office offers truly world-class implant services by both Dr. Peng and Dr. Kan.
Makeovers and reconstruction: Makeovers improve the esthetic appearance of your smile by combining a variety of the techniques already mentioned above along with gingival sculpting to achieve your desired look. During the consultation process, functional challenges with your teeth, bite, muscles and bone structure may be diagnosed. These underlying issues may affect appearance in addition to function. A full mouth reconstruction may be the preferred option for both long-lasting and natural looking results. Dr. Peng’s practice offers a variety of treatments to improve the look of your smile. Ask us how we can help you feel more confident and attractive for your personal and professional interactions. Click here to view before and after pictures of some of our patients. Laser dentistry is an effective way to perform many dental procedures with increased precision, allowing for treatment of a highly specific area of focus without damaging surrounding tissues. If you are seeking extreme safety and comfort, look no further. Dr. Peng has incorporated laser dentistry techniques into her practice and treatments. Periodontal Therapy: Dental lasers are an excellent tool used in the treatment of periodontal disease. Lasers kill bacteria, remove damaged tissue, and promote healthy gums. Laser gum treatment has been shown in studies to be a successful alternative for periodontal surgery for certain patients. Are lasers used in dental applications safe? Absolutely! Lasers are a state-of-the-art precision technology and allow treatment to the exact area that needs it. This protects the surrounding healthy tissue. However, all lasers require eye protection. Safety glasses with special lenses will be provided. Family and guests in the dental operatory at the time of your laser treatment may also be asked to wear protective eyeglasses. Lasers represent an innovative and more precise technology to enhance your dental experience. With Dr. Peng’s laser dentistry, you may find that you feel more comfortable and less anxiety during your treatments. Dr. Peng has completed extensive specialized training in implant dentistry, and has helped many patients enjoy the benefits of this leading approach to tooth replacement. Request a complimentary consultation today with Dr. Peng about tooth replacement using Dental Implants! In our office we use a soft tissue laser technology called ezlase from Biolase. With such a precise active range from the tip, lasers provides pinpoint accuracy, reducing the chance of causing damage to healthy tissues. These instruments are as safe as anything used in dentistry. The only safety measure necessary during laser treatment is proper protective glasses, which we provide for your use. LASER PERIODONTAL THERAPY (LPT) can have many advantages over traditional periodontal (gum) surgery. It has been cleared by the FDA and has been shown to be successful in scientific studies as a successful alternative to surgery for appropriate candidates. LPT is a patient-friendly, minimally-invasive procedure that’s a great improvement over standard gum surgery. Laser Periodontal Therapy (LPT) LPT is an amazing breakthrough in periodontal treatments. If you have been told you need scalpel and suture gum surgery, there's a laser alternative you need to learn about. If you're like 100 million other Americans, you could be one of 50% of Americans who have periodontal disease, the major cause of tooth loss in adults. Periodontal disease starts off as plaque, an opaque film which eventually hardens, forming tartar or calculus. The way to repair the damage is to get rid of the infection and close up the pockets. Until now, that meant surgery and sutures. But today, Dr. Penny Peng offers LASER PERIODONTAL THERAPY (LPT), a patient-friendly, minimally-invasive procedure that’s a great improvement over standard gum surgery. Dental implants are a form of cosmetic and prosthetic dentistry in which one or more missing teeth are replaced with artificial ones. A dental implant restoration is commonly composed of a titanium material screw and a crown. By placing an artificial tooth and root, bone loss in the jaw can be stopped or even prevented. Of all the restorative options available, implants have proven to be the most effective both functionally and esthetically. If you are considering dental implants, then schedule a consultation with us. During the cosmetic/implant consultation process, we will take a picture of your current smile and, using the services of Virtual Smiles®, we will show you what your new smile will look like. Virtual Smiles® creates professional digital simulations that to show a realistic representation of how a cosmetic procedure is likely to turn out. It is comforting to know what the end result will look like while going through the consultation and planning process. Along with your virtual smile, we will also thoroughly examine your teeth, gum tissue, and bone structure, take X-rays, and order a CT scan to ensure you are a good candidate for implants. Next we will design a treatment plan tailored to your specific needs. 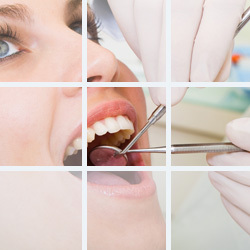 This plan may involve a series of procedures including tissue and bone grafts in order to create the smile you desire. Dental implants appear natural in part because of osseointegration. An initial hole is drilled and then slowly widened. A titanium implant screw is placed in the hole, a protective cover screw is placed on top, and surrounding gum tissue is secured. Once healed, an abutment and temporary crown are placed to further natural gum growth. Soon after, the procedure is completed with the placement of a permanent and natural looking crown. Treatment and recovery may take from three to nine months depending on your individual case and the course of treatment. Success depends greatly on good oral hygiene habits – regular brushing and flossing – to avoid infection. Swelling and discomfort, if they occur, are usually minimal. Follow-up visits and cleanings will be scheduled to remove stitches and to monitor your oral health. Contact us today to schedule your cosmetic and implant consultation and take that step toward your new smile. Laser dentistry is the latest advancement in dental technology. The lasers we use in laser dentistry at our practice are an alternative to the common hand-held scalpel. These lasers direct an invisible energy beam onto problem areas and allow us to efficiently treat gums. The benefit of laser dentistry is that they minimize the pain most often associated with dental procedures, meaning more comfort to our patients. Clinical studies show that approximately 96% of all patients require no anesthesia when lasers are being used during some dental treatments. Dental lasers have been approved by the Food and Drug Administration and are safe for both adults and children. 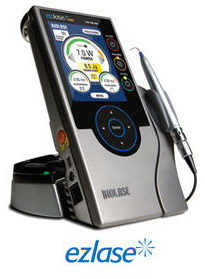 In our office we use a soft tissue laser technology called ezlase from Biolase. For more information please click on the Laser Dentistry link above on this page.